Pish Posh Baby is an awesome baby boutique. They have some great products and I love their Mom Reps. They sent me this awesome package a few months ago with some of my favorite products. Before that, they sent an amazing product to tackle toy storage. Right now, I'm loving my jogging stroller from them. They carry a lot of my favorite brands, but there's still something missing. Pish Posh Baby doesn't sell cloth diapers! GASP! I know, I know. It's awful! So I need your help! Help me convince Pish Posh Baby to carry cloth diapers in their store! 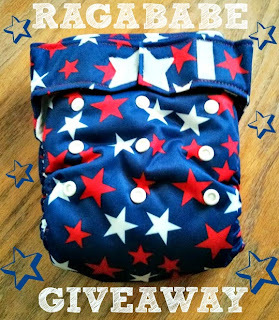 In exchange for your help, one of you is going to win this highly coveted, gorgeous diaper! Can you say RAGABABE? I must love you guys because even I don't own a Ragababe! It's hard for me to give this baby up! It would be perfect for Memorial Day on Monday or Independence Day coming up! Cloth diapers would grow their customer base! There are so many great things about cloth diapers but I'll simply focus on one - they're so much better for the environment. Regular disposable diapers require thousands of tons of plastic and hundreds of thousands of trees to manufacture. That's just to make them. But once they've been used and discarded, well that's another story. Simply put cloth diapering is a great investment all around! They showcase the best products on their site so why not the best and safest diapers too? Your current customer base would be introduced to a green, environmentally friendly method of diapering their babies. PishPosh should sell cloth diapers because they are the iPhone of the diaper industry. At first, you don't want one, then you try it and realize you've been missing out on a great thing for a long time! It would give more moms who don't know about cloth diapers the chance to learn. And it would be one more place I could buy mine from. I think cloth diapers would bring in new customers and it really is a growing trend and would be good for their look and style!!! Cloth diapers are growing in popularity and would bring in new customers! Cloth Diapers are also a way to get people to spend more money! Not a good thing for me, but they are addicting!! And if you offer incentives, it will get people to look at other things on your site. Because everyone who tries to be environmentally friendly at least attempts cloth diapers! Customers that come to the site to order their awesome products would just have to add a cute cloth diaper to the order. I think adding a variety to the site makes it more appealing to get more while ordering so your more excited when it arrives. You can have so many different cute prints for all the diapers. Adding cloth products would increase their client base! They should carry cloth diapers because their customer market would skyrocket! There would be a whole new influx of customers and carrying cloth diapers supports the environment and safety. If they carry WAHM diapers, they would be supporting families as well! Pish Posh Baby is a great store! Adding cloth diapers would bring in a whole new set of moms that would buy diapers as well as carriers, diaper bags, bedding, carseats, etc! you will make HAPPy a lot of mommas around you and your mark will increase. Cloth diapers are so cute that they become addictive to buy. So it would definitely improve sales! They should sell cloth diapers because they would fit in well with their other products and bring in new customers. Cloth diapers are so good for the environment and for baby! Carrying cloth diapers will definately increase exposure for your company!! I think it's crazy to have a baby store and ignore the huge market of cloth diapering parents! Hey Pish Posh Baby, cloth diapers is where its at! You should definitely start carrying them in the store. Pish Posh Baby should carry cloth diapers (and prominently advertise them!) because I believe that the more people see the diapers (especially all the cute prints), the more people will consider cloth diapers over disposables. The more exposure people have to something, the more likely they are to do/purchase that thing. Not only are cloth diapers great for the environment, but it would increase your fan/customer base! Cloth diapering parents tend to be very loyal customers. If you get their business, you'll often have it for a long time! Every parent diapers their baby. There is a wide selection of brands and types of cloth that PishPosh can inform their customer base on. Cloth diapers can be overwhelming to look into, but PishPosh does a GREAT job at clarifying and helping parents make decisions on what will work for them and their baby. I think adding cloth will broaden their customer base and introduce more parents to cloth which will help our ecosystem AND save money for the cloth converts! PishPosh, you always have the customers best interest in mind, please bring cloth to your store! They have a ton of other great products. It's always nice to shop all in one place. Pish Posh sells all sorts of other quality products, why not sell quality cloth diapers as well? Let's face it, cloth diapers are addicting and would boost their booming business even more! cloth diapers are becoming more and more popular with moms and would boost your business tons. Add quality yet reasonably priced cloth diapers and you will boost your sales tons! Cloth diapers are awesome! They save money, are better for baby, and for the environment! Cloth diapers are the way of the future!! Because cloth diapers are as chic as that Bugaboo stroller!! ;) The mamas that are shopping at your store would be very interested and intrigued to see cloth diapers on your site. It would help to grow this great community! Cloth diapers are modern and chic! They are becoming mainstream! Personally, I'm only registering on sites that have cloth diapers. So, maybe you'd get more cloth diaper mommas registering on your site! More business if you sell cloth! Cloth diapers save money and help the environment. People will want to buy them and it's quite addictive. It would get you even more business. I think you should add cloth diapers because they are super poplar right now! You could have some hard to find brands and it would be nice to offer super cute options to go with your great products! They should sell cloth diapers because they seem to sell everything else! Why not round out your inventory? Pish Posh Baby should carry cloth diapers because they are adorable, more eco-friendly, and I'd love to see them on more babies' bums! Yay for cloth diapers! Pishposh sell cloth diapers because I would buy them from you! With all the other great products they carry, it just seems like the next logical product to add to their line up! I think they should carry cloth diapers because more ppl are opting to do cloth rather then disposable and there are never enough places to get them. Cloth diapers are growing in popularity and they are eco friendly. They should carry cloth diapers because there is a profit to be made, they are helping the environment, AND they are the cutest clothes on a baby!! I think they should carry cloth diapers because more people are choosing cloth rather then disposable and there are never enough places to get them. I think they should carry cloth diapers because their products are top of the line. They know that parents want the very best for their babies and cloth diapering is right in line with the other products that they sell. When I went to see what product I would want from PishPosh I went to look for Cloth diapers and was really bummed that they don't carry them. You may want to rethink that PishPosh!! I think that selling cloth dipes would be a wonderful idea for them because I know personally that I prefer doing my online shopping in one place and having large orders shipped as opposed to waiting for many smaller packages. I think they should carry cloth diapers because the cute factor will get more people into the store. Or the other way around, when people come in to see other baby stuff they could become interested in cloth! Pish posh should carry cloth diapers because they are super cute and fun. They are also getting very popular. definitely gain more customers, more revenue, more 'specials' that would bring people "in"! cloth diapers rock! would get more customers. I love shopping online, and if I could buy cloth diapers in the same place as toys I would! There are more and more parents choosing to CD for various reasons. All up-to-date baby stores should carry cd. They should carry Cloth diapers because it would increase there customers, and they are awesome..
Cloth diapers are very posh and can be a great green accessory. Carrying cloth diapers would increase their customer base. It would be easier for moms-to-be to set up baby shower registries and it would make it easier for those purchasing gifts at the same time! carrying cloth diapers would be a smart business move, because they sell. it would bring in new customers, as well as get loyal customers to spend more of their money there. also they are safer for babies than disposables, to go along with their safety products like car seats. Eco friendly and super cute! Love having multiple options to purchase Cloth Diapers. They should carry cloth diapers because it is an eco friendly option in baby care. They should carry cloth diapers because they are a green/eco friendly options for modern mothers (these are NOT your mom's cloth diapers LOL). In todays tough economic times every family big and small are looking for cost cutting options for everything and cloth diapers are VERY easy on the pocketbook compared to disposable diapers. Additionally my kids had allergies to all but one type of disposable diapers compared to no allergies with cloth diapers. Why shouldn't they?! It would expand their customer base dramatically! Cloth Diapers are better for your baby, the environment, and your wallet. They help to reduce diaper rash, use less chemicals, produce less waste, and not to mention they are wayyyyy cuter than disposables! PishPosh Baby - I am a HUGE fan of your site and love everything that you have to offer your customers, in fact, your website is the FIRST that I recommend to all of my friends and moms from my children's playgroup. Please, oh PLEASE offer cloth diapers to your inventory! Not only are they the best option financially and for the environment, but also for baby's health! Quality cloth diapers are a must-have for any store offering the best items for babies. They are cost-effective, fun, and great for the environment! You already carry high end and extremely sought after products, but your missing what parents need and want most! Cloth Diapers!!! You should carry cloth diapers because they are so cute! Cloth diapers are making a comeback! You would gain new customer base and show that you care about the environment. I think carrying Cloth Diapers would be great as they're eco-friendly and are gentle on babies skin. Dear Pish Posh, I think you should carry cloth diapers because they fit in well with your other child friendly products, you'd grow your customer base, and educate other families about modern cloth diapers. Cloth diapers would be the next natural thing for them to carry. They could have really 'posh' styles for all those pishposh babies. They carry such a variety of baby items that it would be perfectly natural to carry cloth diapers. They carry the best of almost every baby item, they should carry cloth diapers too. Then their customers can buy everything in one place, from pishposh. Cloth diapers are sweeping the nation! The demand is high - so pish posh would make a killing! Great for babies, very popular! Cloth diapers are growing in popularity and since the site already carries a lot of baby products, adding cloth diapers just makes sense! clearly there are a lot of us ladies who love our cloth diapers! I see a whole new market for them! They're cute and great for babies. Plus the market is hot for them! cds are huge mom would go nuts and your sales would boom!! Cloth diapers save money thats why they should carry it! The amount of costomers they would recieved! Cloth diapers are amazing! I bet many of their current customers already use cloth, and would love to shop at their favorite baby site for their fluff! Because cloth diapers and diaper accessories are great add on items for larger purchases. They should carry cloth diapers because customers LOVE options and having the option of cloth diapering is on trend with the whole "go green" thing. You should carry cloth diapers because they are eco friendly, better for your baby's bum, and super cute! Carrying cloth diapers would get you much more traffic to your website and store! Plus it'd open a whole new world to established customers. CLoth diapers would be a huge sell. You should carry cloth because not only will it get you more sales and not lose you any, but they are so eco friendly, and really it's our responsibility to leave this earth in as good of shape as we can for our little ones. It's like a gift to our little ones to carry them and make them more available!